[Equihunter – 12th May, 2016] We’ve all been working hard in recent weeks creating and perfecting the new 2016 design changes to our fabulous Equihunter Arena. Now we are ready to release for sale the first Arena 3.5 Tonne horsebox off the production line. Available from May 25th, with viewing either in Yorkshire or at the Felbridge Show Centre. 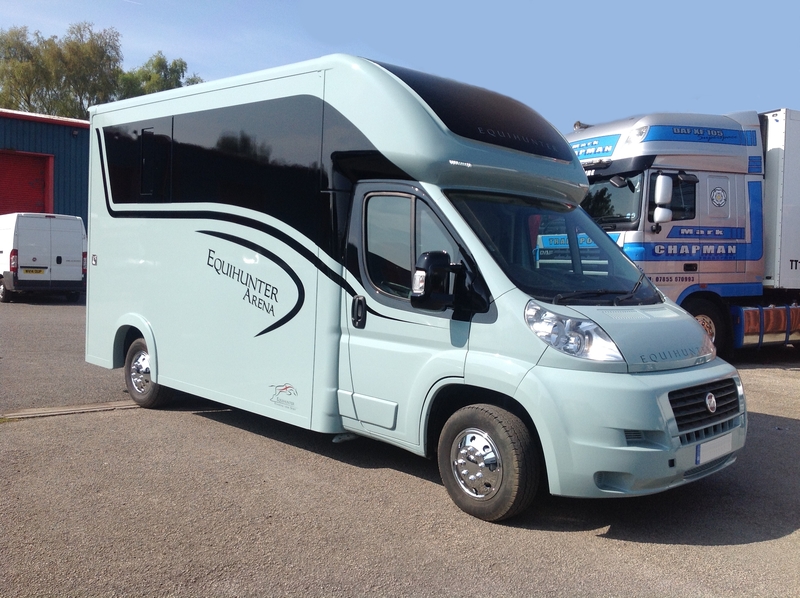 The 2016 Equihunter Arena 3.5 tonne Horsebox finished in BMW Mini Ice Blue …. This beautiful 3.5 tonne Arena is in ready right now for immediate sale. It’s based on a 2011 Fiat Ducato chassis and is priced at £28,500 inclusive of vat. 12mm solid single piece rubber flooring on an aluminium base. For more details or to see our demonstrator vehicles in Yorkshire or West Sussex simply call Chris on 01342 821100 or 07904 818389, or email us at sales@equihunter.com. See our online brochure here …. To see our Finance Options, just click here….